Spectra Logic, a specialist in deep data storage, has announced Spectra TFinity ExaScale Edition — the world’s largest tape storage system designed to address the needs of organizations with exponential data growth, such as those in media and entertainment. Spectra Logic said the TFinity ExaScale Edition provides performance, reliability and flexibility at a lower price point, for long-term data retention with a smaller storage footprint. It is the first tri-media tape library compatible with LTO drives and media, TS1150 tape technology and Oracle’s StorageTek T10000D, T10000C, T10000B and T10000A enterprise tape drive technology. 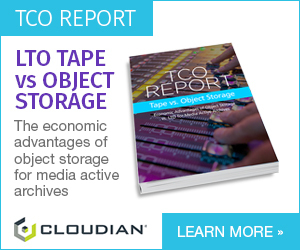 The technology, the company said, provides the flexibility to integrate LTO or enterprise tape technology media at the lowest price per gigabyte. Organizations now have the ability to switch vendors, if needed, and migrate existing data to their technology of choice. TFinity addresses storage for groups that require long-term retention of massive amounts of data at a lower cost, such as media and entertainment companies with large content libraries. “Organizations that produce massive amounts of data continually face the greatest storage challenge of our time: managing growth without complexity or cost. Tape is still the simplest, most cost effective, energy efficient storage media available,” said Matt Starr, chief technology officer, Spectra Logic.